During the remodeling or the new construction of a home, one of the priorities that is often overlooked by the contractors is the kitchen ventilation fan system. In a nutshell, the kitchen fan ventilation system is installed for the purpose of eliminating the particles generated from cooking and the excessive moisture that dampens the atmosphere and causes the formation of mold across the ceiling and the walls over time. In essence, the air that is saturated with food particles and moisture is hot due to the cooking process. The laws of physics dictate that hot air has a tendency to rise above the cooler air. Therefore, given the fact that the updraft kitchen ventilation fan system is placed above the stove, cooker or microwave, it is able to use this principle to its advantage. On the other hand, the downdraft ventilators have to fight the natural motion of the air, meaning that their motors have to be significantly more powerful in order to provide the same performance. Also, most updraft ventilators allow homeowners to install a lighting system, which is quite convenient for night cooking or extra visibility. 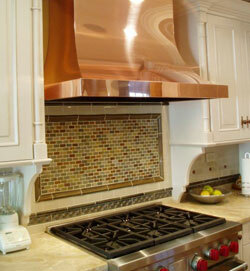 The role of the range hood is to provide localized absorption of the air resulted from cooking more proficiently and guide it towards the fan and through the filters. To put it simply, it acts like a large funnel, allowing for superior suction. Furthermore, the fan has the purpose of providing the air circulation to through the entire ventilation system, meaning through the filters and to the ductwork, if one is present. The presence of filters is optional but recommended even if the ventilator is connected to a duct, because they absorb the food particles, moisture and smoke rather than allowing them to deposit along the pipelines and cause rusting. In regards to the ductwork, the air exit should be located in the exterior of the home, whether it is the roof or an exterior wall. Two main factors influence the effectiveness of ventilators: sufficient motor power and regular maintenance procedures. In order to decide on a ventilator with sufficient suction power, owners need to verify that the specified CFM value is equal to the double of the room’s square footage. Furthermore, timely maintenance, which implies cleaning the hood, filters and blades, ensures that the dirt accumulations do not put any additional strain on the motor and that it is able to run at maximum efficiency.